Ozzie preached to the wrong choir about Art's HOF credentials. 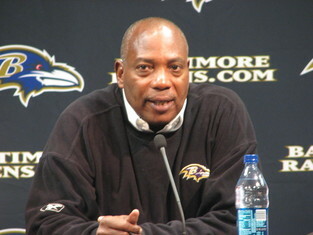 Ozzie Newsome is a Cleveland Brown and will always be a Cleveland Brown. Those aren't my words, but those of the man himself in a guest column he wrote for the Plain Dealer today. "The Wizard of Oz" used two paragraphs to thank fans who supported him even when he was getting just one three-yard dink pass each Sunday to extend his reception streak (Those are my words, not Newsome's). The ex-tight end's honeyed remarks were followed up by the expected blow: "I believe Art Modell should be in the Pro Football Hall of Fame," he wrote. It's a lovely thought on Ozzie's part and certainly an arguable one. Newsome credits Modell for being at ground zero during pro football's modernizing forays into the TV era. The late owner also contributed to the game's business history, Newsome continues, negotiating the first collective bargaining agreement and serving as an instrumental figure in the merging of the AFL and NFL. "As I look at it, because he took over the running of Cleveland Stadium - and he did that at the request of a mayor of Cleveland - his finances were never what they should have been in just owning an NFL team. In the end, to stay in the business, Art moved." A revision of history to say the least. Instead of selling his "business," Modell took an iconic team away from the city that adored it. What if George Steinbrenner had packed up the Yankees and moved them to Jacksonville after getting a sweetheart deal? He would have been crucified for all time and deservedly so. No matter what Modell has done for the game, moving the Browns erases his past contributions. The saying "It takes a lifetime to build a reputation, and a moment to destroy it" was made for guys like Uncle Art. That's not the issue here, however. What I would like to ask Newsome is why he felt the need to share his views directly with the people of Cleveland. Sure, the Plain Dealer gave him an outlet and I don't blame the newspaper for taking a hot topic and trying to crank some readership out of it. Newsome should have known better, however. He must realize the wounds of The Move are still fresh, even if Cleveland, as he states it, got its team back and now plays in a "beautiful home." Now, it's not necessarily Modell's fault that the Browns from 1999-2012 were a miserably run club, and there's no denying that Newsome has done a superb job as Baltimore's executive vice president and general manager. Thing is, Browns fans don't want to reminded of any of that. There's no percentage in stating the obvious to a fanbase that's only going to get rankled by Newsome backing the man who so crassly ripped their team away. Of course he's going to push for his former boss getting a bust in Canton. Newsome just didn't need to preach to Cleveland about it when he could have gone to Sports Illustrated, NFL Network, the Shithouse Falls Examiner, or any number of other publications or blogs that would have been happy to print his thoughts in the run-up to Hall of Fame selection weekend. Jack Nicholson said it best in "As Good as It Gets:" Sell crazy someplace else, Wiz, we're all stocked up here.